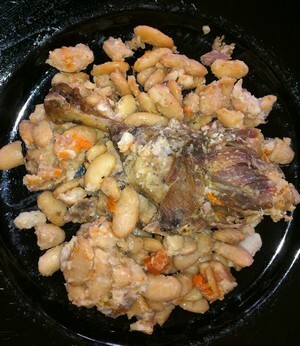 Cassoulet, the French Take on Pork and Beans, Only so Much Better! 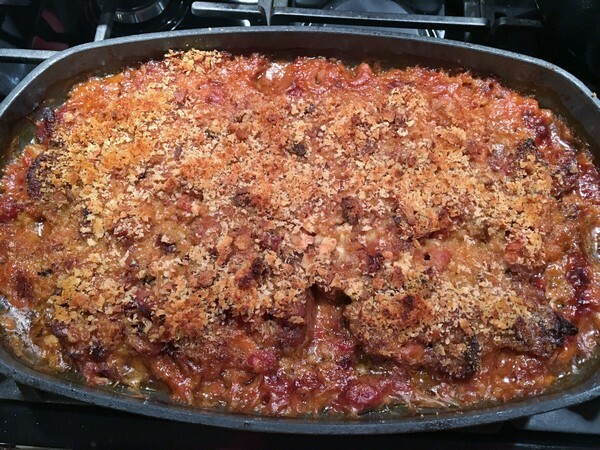 Cassoulet is a classic French dish of either duck or goose confit, sausages, and beans. It’s a great example of a simple dish, riffs on pork and beans taken to another level. The Accidental Locavore recently got an offer from D’Artagnan for 20% off their cassoulet kit. Since my parents were supposed to be coming for the weekend, it looked like a good weekend cooking project, not to mention a terrific January dinner, so why not? In between snow storms, a huge, really huge, box arrived from D’Artagnan. In it, beautifully packaged, was everything you need to put together a cassoulet dinner. Part of what makes making cassoulet difficult (in this country anyway), is assembling all the ingredients, but now that was all done, and all that was needed was a hungry audience. A very hungry audience. For in my ordering excitement, I never read the fine print, and had no idea that this cassoulet kit, actually fed twelve people! Unfortunately, my parents have been snowed in in Boston for the past, let’s say, month, so I decided to round up a bunch of the best eaters I know and have a cassoulet party here in the city. D’Artagnan really makes it easy, the only thing I needed to buy was a carrot. You soak the beans the night before, cook them for an hour with a couple of onions, the aforementioned carrot, and a bouquet garni, and then move into constructing the cassoulet. 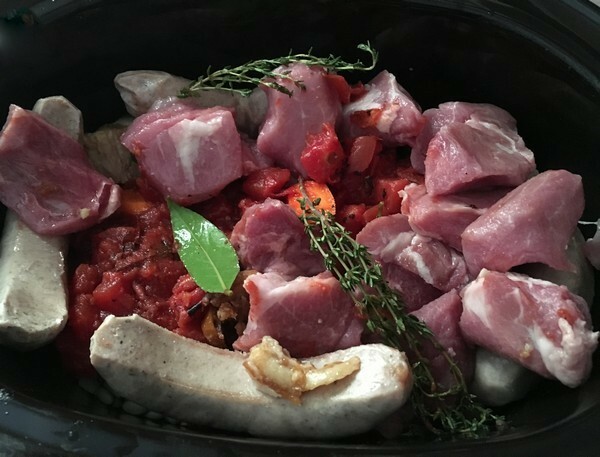 A layer of beans goes in the bottom of a very large casserole, followed by the duck confit, some sliced garlic sausage, pork ventreche (fatback French style), and some duck sausage. Top with the rest of the beans, and pour over a mix of duck demi-glace diluted in water, cover and cook for about 2 hours in a low oven. You can’t imagine how good it smelled. So my hungry friends schlepped through the remnants of yet another snow storm, and devoured the cassoulet, the braised leeks, a lovely spinach salad my friend Holly brought, and many bottles of wine. For desert Laura made a warm apple tart, and Robin brought an amazing chocolate cake. It was a fun dinner, a delicious meal, and the perfect thing for a snowy January night. I’d order another one from D’Artagnan in a heartbeat, it’s a great way to entertain. 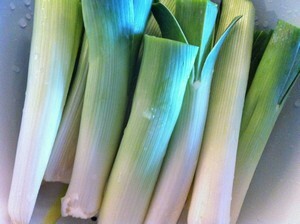 This week’s cook-along recipe is for a easy vegetable side dish, braised leeks. Working from the biggest cookbooks the Accidental Locavore owns, this week’s cook-along recipe for braised leeks comes from an old favorite, Julia Child’s The Way to Cook. I was looking for an interesting side dish recipe to go with cassoulet, and thought braising greens, something like leeks or endives would be a nice homey vegetable that would work with the richness of the cassoulet. You can use the technique on lots of different vegetables, some classics include celery, and endives. For 6 servings. Adapted from The Way to Cook. Preheat the oven to 350 degrees. Butter an oven proof baking dish big enough tho hold the leeks. Prepare the leeks for cooking: trim the root ends of the leeks being careful to keep the leaves intact. Cut the tops of the leeks, leaving them about 6-7″ long. Cut in half lengthwise, fan the leaves out and wash thoroughly under cold running water. My leeks were amazingly dirty, so really take care washing them. Arrange the leeks cut side down in the buttered baking dish. Add the water or broth to come halfway up the side of the leeks, salt lightly, and dot with about a tablespoon of butter. Cover with aluminum foil and bake for 30-40 minutes until tender. When they are done, you can reduce the braising liquid, enrich it with a little butter at the end, and pour over the leeks, or just serve them straight from the baking dish. Enjoy! My rating: 3 stars. Mostly because while working on the cassoulet, I let the leeks hang out a little long on their own. Could have reduced the braising liquid, but didn’t have the time. They were fine and with a little closer attention from the cook, would have been really good. 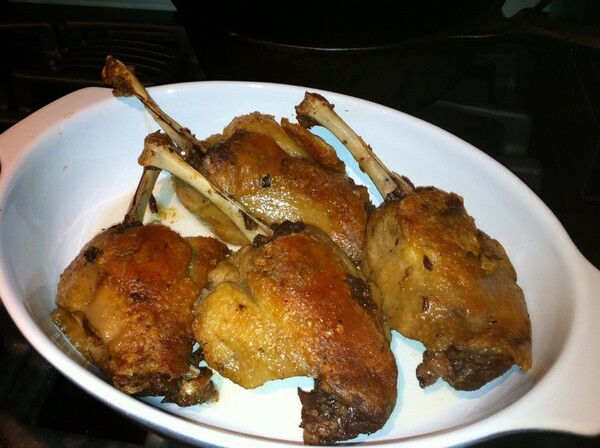 You can also let them cook down and serve with a little vinaigrette, or reduce the cooking liquid, and top with some breadcrumbs toasted with butter, or a little Parmesan cheese. For the rest of my diners, what did you think?